Here is a story that needs to be re-written from snout to tail. There is so much wrong with it I’m not sure where to begin. I love the premise, though. 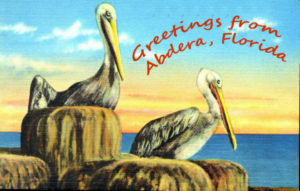 The title came to me one day and I understood immediately what kind of place it was, and that it fit perfectly into the world of Abdera, Florida. Unfortunately, I never got any traction on any of the characters. So, the story has been put back into the vat to allow it to marinate a little longer, but for this month, here is the first shot at a story that will look substantially different when it’s fully cooked. Regardless of its flaws I hope you enjoy! A piercing scream brought Abel upright and immediately out of his nap. A cacophony of animal noises followed. Whatever was happening had drawn the attention of every creature on the estate. Abel reached for the shotgun he kept in the gun closet and limped outside as quickly as he could manage. Dogs barked, cats wailed, the cockatrice crowed, and dragons roared. Abel’s entire universe overfilled with noises of alarm. Some creatures ran toward the intruder, some away, and some froze. Abel followed the dogs toward the disturbance. A large black dog, burning with blue flame, crouched over the bloody corpse of the basilisk. It growled at the approaching dogs, but continued to feed. When Abel saw what was happening he let out a loud whistle.